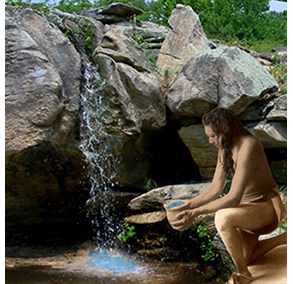 Since prehistoric times indigenous people have made pilgrimages to Lithia Springs to drink its healing water. At the site of this ancient sacred spring are the ruins of a megalithic step pyramid temple that has survived both time and urban development. What remains of a great temple complex are magnificent ancient ruins that give evidence to the significance of the healing powers of Lithia Spring Water. The builders of this forgotten ancient 8th wonder of the world are unknown and their great civilization has been buried under the Georgia red clay for eons. The archaeological artifact evidence discovered at the ancient spring site suggests that the American Mound Builders (possibly Adena Culture) thousands of years ago built this 8th wonder of the world. These ancient stone temple builders left behind their wisdom and knowledge carved solid granite. Giant animals (effigies) carved from granite boulders have stood guard over the springs for thousands of years. 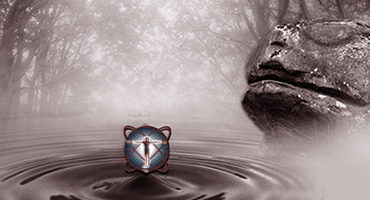 This megalithic temple is a timeless beacon that calls out to future generations of health seekers seeking Mother Earth's healing powers embodied within Lithia Spring Water. 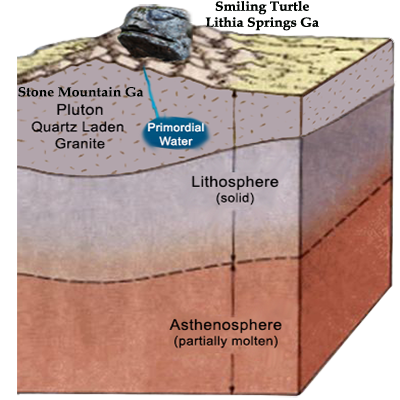 Lithia Spring Water's spring source is deep within the Stone Mountain GA granite pluton. This geological pluton formation was formed at the time of the Blue Ridge Mountain around 300-350 million years ago. At the site of Lithia Springs, beneath the earth's surface, primordial water journeys upward to the earth's surface through a mountain of quartz monzonite. During the waters long journey, through miles of fissures within the granite, telluric currents formed by geomagnetic micro-pulsations energize the water. As the primordial water rises to the surface it leaches minerals from the quartz monzonite granite enriching it with monoatomic/polyatomic minerals and trace elements that include Lithium, Gold, Silver, Sulfate and other rare earth elements that are beneficial to human health. When the water finally reaches the earth's surface it has been potentized and energized with alkaline ionic micro-nutrients, earth energy, and carbonation. Primordial water is extremely rare and there are only a few primoridal springs in the world. These rare primordial springs can be identified by the fact that primordial water contains virtually no nitrates. Nitrates are an organic mineral compound marker that denotes water exposed to the earth's surface through the natural water cycle. Lithia Spring Water contains no nitrates, therefore it's water does not originate from the outside world's toxic watershed, but from a primordial pristine source deep within the earth's crust. Hydrological researchers theorize that the primordial Pangaea sea water is encapsulated within the earth's crust. FYI: Lithia Spring Water naturally contains trace amounts of Lithium (Li3), a primordial element (or, more properly, primordial nuclide ) produced in Big Bang nucleosynthesis. The sacred spring is housed inside a vintage spring house that protects its pristine primordial water from the outside toxic world. 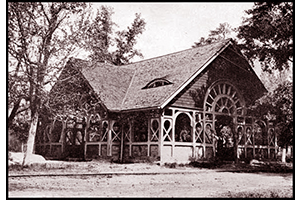 Amazingly this vintage spring house was built in 1887 with technology designed to protect its pristine primordial water from UV light, groundwater, animals, insects and any organic materials that can contaminate its purity and potency. Inside the spring house, there is an ancient wonder to behold. As the primordial water ends its long journey through miles of fissures deep within the Stone Mountain GA granite pluton it flows into a large medicine bowl hewed out of solid granite rock. This ancient medicine bowl is at the bottom a giant 25-foot deep basin that is hewed from solid granite rock. When the pristine primordial Lithia Water flows into the medicine bowl it fills the basin with crystal clear effervescent water that appears to be vibrant and alive. This rare health-enhancing water never sees the light of day until it is poured into a glass from our innovative 5-Liter Eco-Friendly spout dispenser. No UV light exposure to Lithia Spring Water assures that micronutrient monatomic (ORMEs) and polyatomic minerals /trace elements retain their natural energized potency. 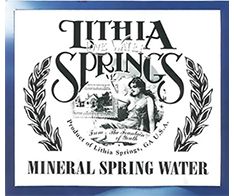 Lithia Spring Water's rare mineral composition places it into a special classification of water called Lithia Water. Lithia Spring Water is extremely rare, there are only a few commercially bottled natural Lithia Water products in the world. In fact, Lithia Spring Water, sourced from Lithia Springs Georgia, is one of the only USA natural Lithia Water products you will find anywhere! The other "Lithia water" products are man-made, processed tap water or spring water with lithium added. What makes Lithia Spring Water even more special is its amazing history. Historic Fact: From the 1880s to World War I the consumption for bottled Lithia water reached massive proportions. 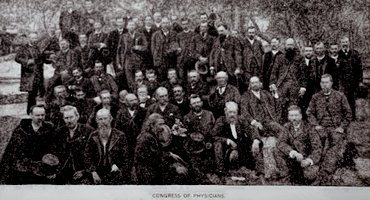 The most premium of all the bottled water brands was Bowden Lithia Spring Water because of its acclaimed health benefits supported by doctors and pharmacies throughout the United States. Lithia Spring Water (once called Bowden Lithia Spring Water) was the first commercial brand of Lithia Water sold in the United States. Lithia Spring Water's rare mineral composition is unaltered retaining all its natural potency and healing properties. Lithia Spring Water is 100% naturally pure, food safe, and Raw unaltered. We comply with all FDA ( Food and Drug Administration) and GDA (Georgia Department of Agriculture) rules and regulations to assure 100% food safety for human consumption. Our production and sanitation processes are technologically advanced and different than must commercial bottled water brands. First; We don't sanitize our water by adding Ozone, a super oxidant. Ozonation can alter the natural properties of some waters and is considered an unnatural additive. Second; our sanitation process is innovative and 100% effective because it uses space-age antimicrobial nano-filtration technology (developed by NASA) and Ultraviolet germicidal irradiation (UVGI) technology to assure there are no organic or biological contaminants. Out Lithia Spring Water is truly all-natural raw sanitized, it's like drinking right from our ancient Native American Indian healing spring. In addition, to guaranteed purity and food safety, Lithia Spring Water undergoes an extensive annual analysis by FDA certified laboratory, to assure the tests meet the highest EPA (Environmental Protection Agency) safety standards. These bi-annual mandatory water analysis test for potential contaminants, heavy metals, radiological, and a long list of harmful toxins. These extensive water analysis also require testing for all the naturally occurring minerals and other properties of the water to assure 100% food safety compliance. In addition, we run small batches directly drawn from the ancient spring and test each batch to assure the highest standards of purity and food safety. Since it was first bottled and tested in 1888 Lithia Spring Water's high mineral composition and pristine purity have been amazingly consistent and food safe. Lithia Spring Water is pristine, natural, and safe for even a child to drink. Only nature's laboratory, the earth, creates natural Lithia Mineral spring water. Many Lithia water products sold are not natural. They are man-made, created by adding lithium to distilled tap water. Replicating the therapeutic properties of natural Lithia Spring Water has proven extremely difficult, and impossible. The body readily absorbs ionized minerals through the intestinal tract's membrane lining that has specific electrical charges in the form of ionic receptors. Because of these receptors, ionic minerals are highly bi-available, allowing them to be easily assimilated through selectively permeable cell membranes. Lithia Spring Water flows from an sacred Native American Indian healing spring where for thousands of years people journeyed to drink its healthful water. Since 1888 this health enhancing mineral spring water has been bottled and delivered to the homes and offices of health seekers. You can now order home or office delivery direct from the source, Lithia Springs GA. 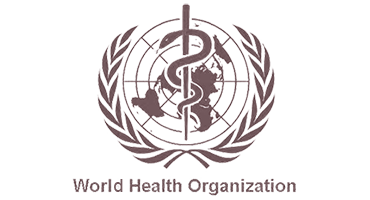 The World Health Organization has recognized Lithium as a mineral nutrient for human health and well-being. The United States does not recognize Lithium as a nutrient. However, a large body of Scientific research has shown that lithium taken in trace amounts is highly beneficial for human health and well-being. Did you know that almost all bottled water brands use Ozone, a super oxidant, to sanitize their bottled water? Lithia Spring Water is sanitized using space age technologies to achieve the highest standards of sanitized safe water without the use of Ozone and without altering the the organic natural composition or properties of the water.